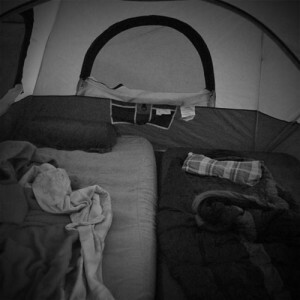 Sometimes when you have the camping bug, circumstances are not in your favor. Where there's a will, there's a way, as they say. You don't have to rely on local parks' availability or good weather to go camping. First, pitch the tent. You can do it in the back yard or in the house, if space permits. Feel free to invite the pets to join you! Then make dinner, eating outside if at all possible. You can cook in the kitchen, over the fire pit, on the grill or your camping stove. Since you'll have access to a refrigerator, the sky is the limit as far as what's on the menu. 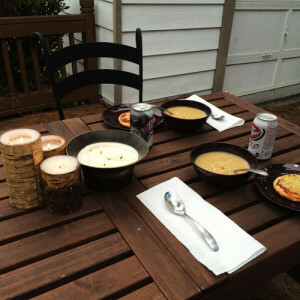 Potato soup, mini pizzas and soda, yum! Make sure to make room for dessert. Our final course of choice was chocolate, chocolate and more chocolate! Bring your makeshift campfire inside with you if the bugs start to cause problems. 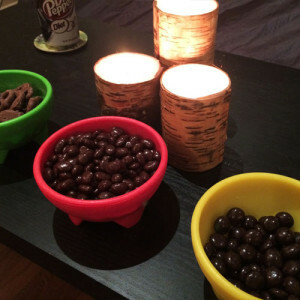 I used these candles for some outdoorsy flair. Finally, when you're ready to hit the sack, blow out the campfire candles and get settled in the tent. Since you're super-glamping, you can even use full-sized air mattresses — what a luxury! No bugs and no quiet hours to worry about! 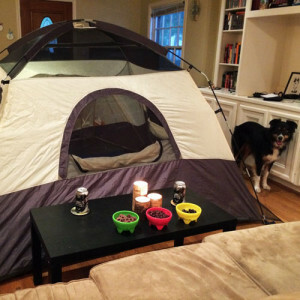 Have you ever camped at home? What were the circumstances? What were your essential camping-at-home items?